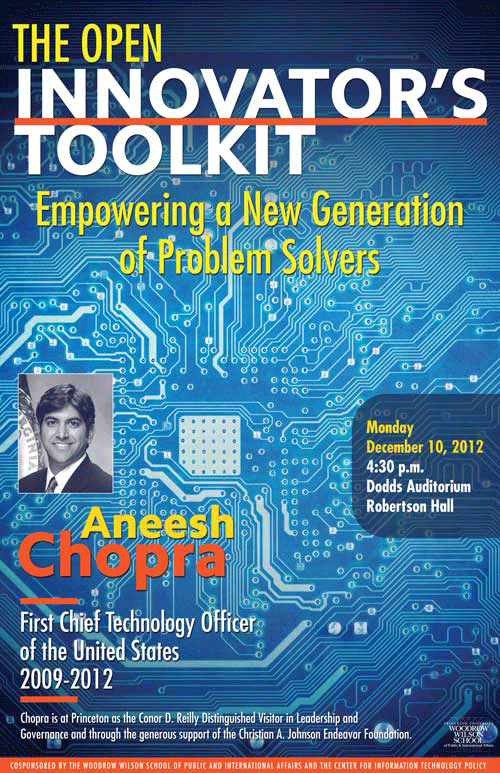 This talk is cosponsored by the Woodrow Wilson School’s “Technology and Public Policy” thematic lecture series and the Center for Information Technology Policy (CITP). Aneesh Chopra, the former and first federal chief technology officer, will be at Princeton as the Conor D. Reilly Distinguished Visitor in Leadership and Governance and through the generous support of the Christian A. Johnson Endeavor Foundation. The “Leadership and Governance” program at the Woodrow Wilson School brings prominent public policy leaders to the School who are unable to spend a full semester or academic year on campus, but can visit for a shorter period of time. While on campus the “distinguished visitor” delivers a public lecture, meets informally with individuals or small groups of students, and participates in classroom discussions. He also served as managing director with the Advisory Board Company, a publicly-traded healthcare think tank. 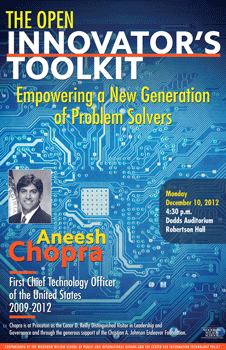 In 2008, Chopra was named to Government Technology magazine’s Top 25 in their “Doers, Dreamers, and Drivers” issue. He received his B.A. from Johns Hopkins University and his M.P.P. from Harvard’s Kennedy School. The event will be archived online for later viewing on the Woodrow Wilson School’s web media site – http://wws.princeton.edu/webmedia.